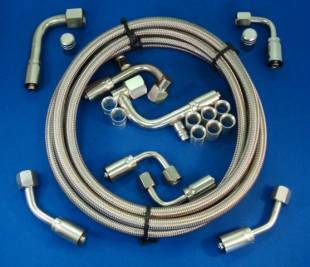 Gotta Show's A/C hose kits are made of complete stainless steel construction (not plated) and come ready to polish. All fittings are female 'o-ring' formed, making them compatible with any aftermarket Air Conditioning system. The hoses used by Gotta Show are made of aircraft quality TEFLON®* lined stainless steel. 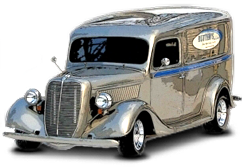 They have been tested in Arizona with 134-A on real vehicles and have given leak free service for over 5 years. The fittings and hoses have over 2000 continuous hours of testing on a modified whip running at 170 rpm with a 4" oscillation. Tight-Fit Stainless Steel that wrap around the backside of the compressor for low hood clearance applications. includes aluminum hard lines for compressor. (1) # 8 45 degree female o-ring fittings.